Reflecting back upon 2017 this morning and one word comes to mind, growth. Harbor Homestead has charted a healthy growth pattern in the last 365 days and I'm proud of our accomplishments. Creatively we've grown as a team and our design work has flourished as a result. From a business perspective, we've built our client base and met some really lovely people along the way whom we look forward to working with for years to come. Did you know...we do potted arrangements too? DID YOU KNOW...WE MAKE POTTED PLANT ARRANGEMENTS TOO? 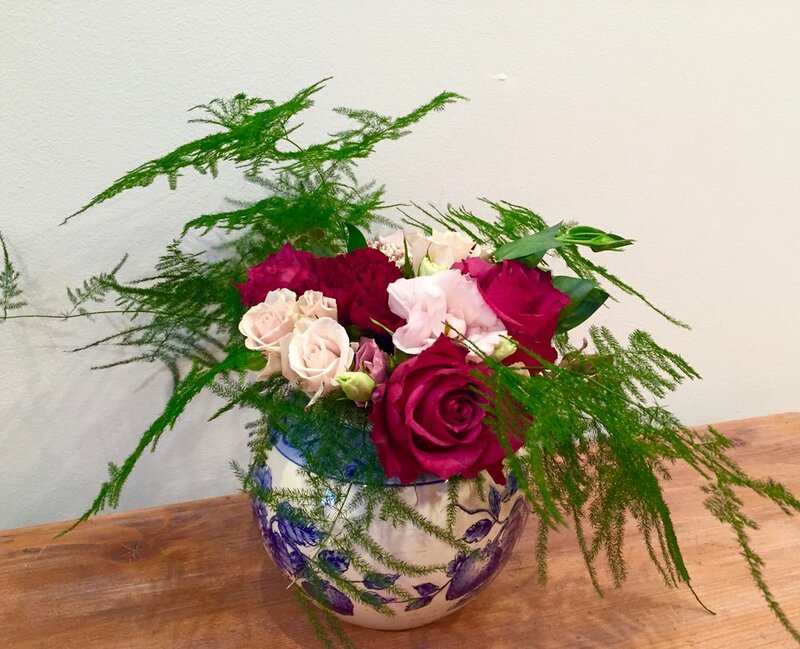 AND JUST LIKE OUR CUT FLOWER ARRANGEMENTS, WE LOVE DESIGNING UNIQUE POTTED PLANT ARRANGEMENTS. CUSTOM-MADE TO ORDER, THEY'RE A LONG-LASTING LIVING GIFT SURE TO PLEASE THE RECIPIENT. VESSEL AND COLOR PALATE CAN BE SELECTED TO SUIT YOUR HOME OR OFFICE. Our Christmas Dress built upon Mrs. Vanderbilt's dress form for the Vanderbilt Museum Twilight Christmas Tour. Constructed of chicken wire, greenery, pine cones, crystals and Christmas ornaments. A blue velvet mannequin cover was created to match the colors in Mrs. V's dressing room. The fireplace in the Mrs. Vanderbilt's dressing room was topped with a simple green garland and draped in crystals to compliment the chandeliers in the room and on the necklace on the Christmas Dress. This week, while dreaming up designs for autumn centerpieces, we where kicking around ideas and inevitably the idea of using a pumpkin as a vessel came up. I was skeptical immediately. Conflicted too because I wanted to explore it & challenge myself to create something beautiful while steering clear of the prototypical, FTD-esque model for a "fall centerpiece". Proud to say, I think we stayed true to ourselves and made them natural & unique. These and other arrangements available to order for Thanksgiving. Call or email us for more information. Some photos of our designs from last week's corporate event for the Young Presidents Organization at Tamarack Country Club in Greenwich, CT. Plum & White Dahlia with Chartreuse foliage accents. Every week we deliver flower arrangements to a few local businesses and The most perfect August day instinctively inspired this week's flowers. Vivid sunny yellows. Purples and oranges like a hazy sunset and sky blue delphinium. Thanks for the delicious cupcake Hometown Bake Shop! From its setting, at the bottom of a grassy hill peppered with wild flowers just a stones throw from the backwaters of the Long Island Sound, to its centuries old, weathered-to-perfection grey planks, the George Weir Barn is rustic beauty at its finest. Built in 1711, the barn is one of several historic buildings on the property of beautiful Caumsett State Park in Lloyd Harbor, NY. On an especially dreary February afternoon, a visit to Long Island's Planting Fields Arboretum was a welcome sight for sullen, winter eyes. Beneath the glass of a marvelous old greenhouse, dozens of Camelias in bloom vivaciously assuring us that Spring is not so far away. Every year we volunteer to decorate the historic Vanderbilt Estate, "Eagles Nest", in Centerport, NY. This year we decorated "The Arcade", a stone hallway with huge arched windows that connects two wings of the mansion. 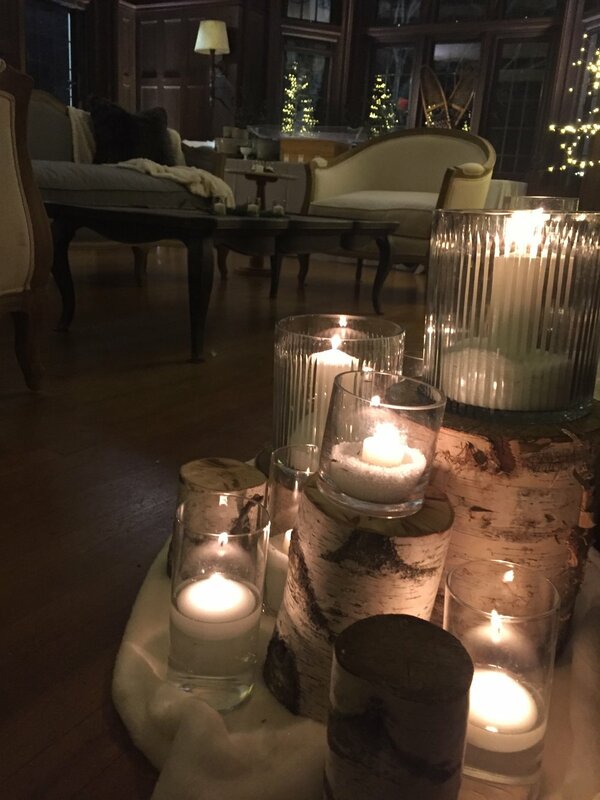 We chose a "Woodland Garden" theme using all natural materials, most of which were foraged from the estate's grounds. Mosses, Pine cones, greenery, holly, ferns, mossy rocks and flat cedar were some of the materials we collected. Greens were used to construct sprays for the hall's 10 stone ledges, the live Christmas tree's garland and the asymmetrical wreaths on the entry doors. Greens and berries were also used to make 3 kissing balls that were hung from from the 3 iron lanterns in the space. Small birch trees were placed on either side of the entrance to the mansion with small decorative birds in their branches. In a dedication to the estate's name, we placed a decorative eagle amid some greens in the elaborate stonework above the main entrance. If you live locally, stop by and take a tour! We had such a fun weekend working the Main Street Nursery Fall Artisan Marketplace. It was nice to see old friends and meet new ones too! We'll be re-stocking our online store with lots of new pieces in the coming weeks so keep checking in with us and remember free local delivery is available! 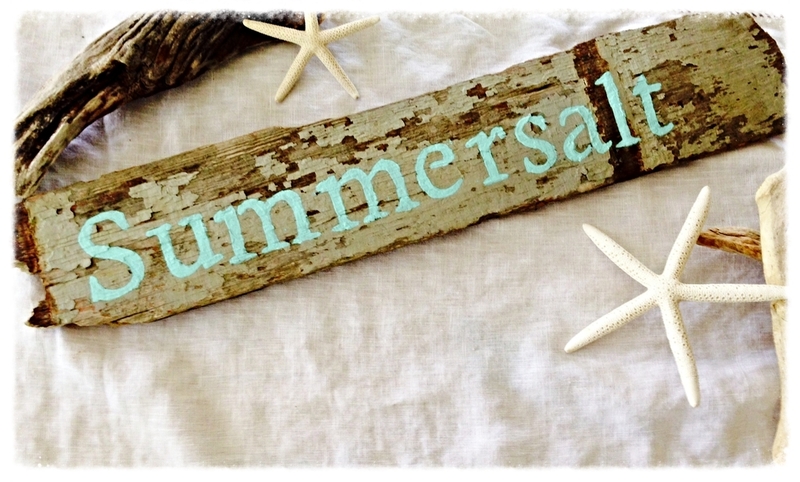 We are on a never ending quest for driftwood to make our custom-made driftwood signs. In the winter, with more storms to wash it ashore and less people to collect it, there's an increased supply but the search is far less enjoyable. No complaints though, even in the bone-chilling cold, I could never tire of any seascape and its smells, sounds and scenery. So with the scant supply of summer driftwood, I was forced to get creative. Bend the rules a bit. With the gracious help of my husband, I traveled off the beaten path, by boat and paddleboard. Landed sort of near where a no landing sign was posted. And there on a glorious summer day, was driftwood nirvana. We quickly gathered what we could, loaded up our two paddleboards, transferred it to the boat anchored just offshore and kindly waved hello to marine police as we slowly drove away. Our driftwood signs make great wedding gifts or save-the-date announcements especially when paired with our garden-style floral arrangements. 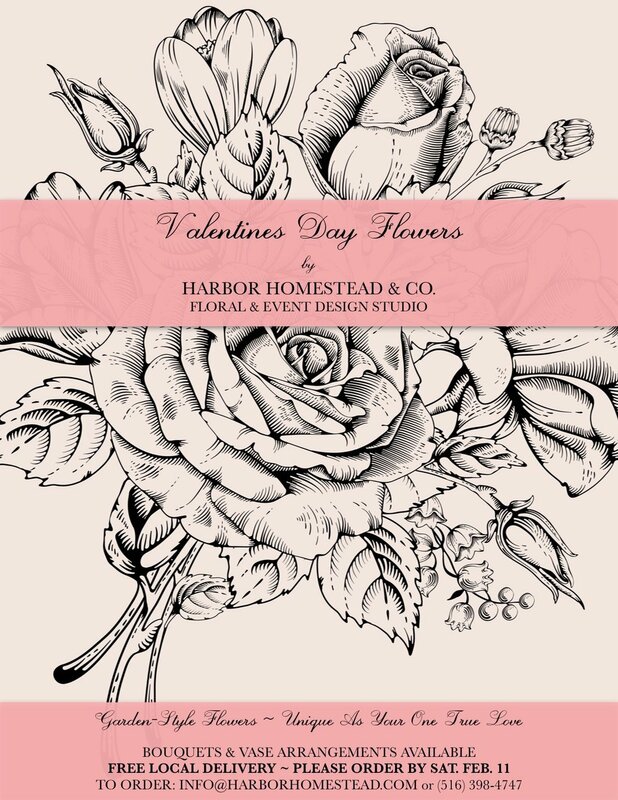 For more information about our custom signs or floral designs: info@harborhomestead.com or (631) 385-1580. The seed catalogues are arriving daily. All my favorite magazines are filled with gardens from around the world in all their splendor. I'm receiving emails from garden designers about the up coming spring . As I look out the window alas my garden is covered with the last snowfall and another storm is now being discussed as "on the way". So how does a gardener,lover of nature and an addict of summer remain hopeful? I day dream. As a child I remember that feeling when spring was on the way and that first 60 degree day came .It was glorious.You could smell the soil. You could practically hear the crocuses breaking thru the ground. For me it meant flowers, birds, a new Easter dress and my best friend Gwen and I setting up our outdoor kitchen in the woods behind our houses. The inspiration for this kitchen came from a treasure of a book that Gwen's grandmother bought for two very bored little girls one summer." Mud Pies and Other Recipes ",by Marjorie Winslow. Gwen's grandmother was like having our own Aunt Bee (Andy of Mayberry). She would pack us a picnic lunch or present us with cookies for no reason at all.She drove a gray VW bug and could hardly see over the steering wheel . She wore an apron all day and had the most beautiful silver curly hair .She always had on red lipstick.Her blue eyes sparkled every time she saw us running in the house for that perfect container for our kitchen. Gwen's parents worked all day.her Grandmother who lived with them Mrs. Ward watched her.Her Grandfather was a retired writer/illustrator who did crossword puzzles in the afternoons. Her parents were happy people who would singa d play the piano.They laughed alot.Her dad always came home from work whistling up the driveway in his plaid seersucker shirt and carried a black lunch box. She had two older sisters. Her sister Robin was either at the library or reading under a tree .Her oldest sister Barrie played the piano and filled the neighborhood with Broadway show tunes. Sometimes the neighbors would grab a lawn chair and park themselves on their front lawn just to listen. Our kitchen had three tree stumps and a large flat stone placed in the sun which served as our oven.We had an old tin percolating coffee pot whose glass knob shimmered thru the dappled sunlight in the woods. Various containers served as our canisters .They were filled with loam soil from the woods, sand from the beach and acorns from the woods. We would gather sawdust from the floor of Gwen's fathers wood shop. There was a wooden crate for our dishes, which were anything from an old pie tin to a milk carton.We had mismatched cutlery and sticks that were perfect for stirring. My favorite dish to make was the Sawdust Upside down Cake.It had to sit over night. We would return the next day and anxiously turn the cake over. With a sigh of relief we would garnished them with fresh honeysuckle flowers that I would pick from my fence on my way to the woods. Hours went by like seconds as we followed each and every recipe. At days end we would pick another recipe for the following day. We parted saying " don't forget to bring the acorns", or " bring your watering pail tommorrow ". We never forgot . On hot summer days we would be at the beach. Collecting shells and other treasures for future recipes. When one of us would be given a chipped tea cup or an orange juice can by our moms to take to our kitchen we would be giddy with our new addition. Now every time I put my trowel into the soil that joy of digging, picking flowers and collecting acorns comes back to me. When I walk the beach I still return home with treasures I have found. I still get that same feeling of peace and calm as I leave them on the table of our porch.A piece of beach glass, a weathered piece of driftwood or a pocket full of Jingle shells can make my day. Many years ago I gave my daughter Krishtia her own copy of Marjorie Winslows book. I recommend this book for any child.if you do buy it prepare for them to get a little dirty. This past June I became a grandmother for the first time. A little girl! Just the other day I asked my daughter " Do you still have your copy of Mudpie's and Other Recipes?" I'm happy to report she does. My copy is a bit worn but oh the fun my little grandaughter Maya and I will have! Marjorie Shreeve Winslow, a former Riverdale resident, died in her Duxbury, Mass. home on Nov. 30. She was 89. Born in Muncie, Indiana, Ms. Winslow moved to Phoenix, Arizona when she was 3 years old. She attended DePauw University in Indiana, graduating in 1945. While a senior, she entered Vogue’s prestigious Prix de Paris competition and was among the winners, receiving a job as a copywriter at the magazine. She became a fashion editor, working in that capacity for both Vogue and Mademoiselle, in both Los Angeles and New York, for several years. She married Richard K. Winslow, a newspaperman, in New York in 1950. The couple raised their three children in Riverdale. Ms. Winslow’s accomplishments were many and varied, according to her family. She wrote and published a children’s book, Mud Pies & Other Recipes, in 1959, which has been in print almost continuously ever since. The New York Review of Books Classics issued a new edition in October, 2010. Often ahead of her time, she started a Mexican food business in New York in the 1960s. She was also a carpenter, upholsterer, clothing designer, excellent cook and was known by friends and family for her dry wit. In villages, towns, and city's all across America today we are honoring all those who have lost their lives to keep Americans free. Growing up in the small Village of Northport, N.Y. My brothers and I would run down to the Main Street and wait along the curb for the start of the parade.9:30 sharp! My mother would dress us in patriotic color's. The parade was always led by Dr. Fredricks a local vetrinarian, riding atop his trusty steed. A palamino whose mane was braided with red, white. & blue carnations. He wore a red riding coat and shiny black riding boots.Down Main Street toward the harbor he would ride flanked by hunting dogs his head up blowing his horn. The local high school band...the best in all the land would follow, boy scouts, girl scouts...firemen driving vintage trucks. We would look for my older brother with his cub scout troop and my sister who played the Glockenspiel in the marching band . The Lewis Oliver Dairy would have a tractor pulling a flatbed filled with hay and farm animals whom we all knew by name. Then the veteran's would march by and some who could not walk would ride in convertibles all gleaming and waxed to perfection. I still can see the shiny chrome reflecting in the sun. Young soldiers with their rifles perched upon their shoulders would pass by and I remember feeling amazed that real United States soldiers were right before me. After it was barbecues and back yard games. Today we would like to thank all of the men and woman who have kept this country safe.... and who continue to do so every minute of everyday. To my Uncles, John, Ken , Bob, Dave, and Frank my father in law Harold all who were all part of the greatest generation .Thank you for your service to our Country.